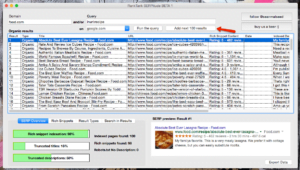 RankTank SERPitude is a completely free desktop app with a ton of functionality, allowing you to examine SERP appearance and results in detail. Check your rich snippet indexation and content, see which results have image thumbnails, check for title and description issues, and see what things look like LIVE in Google results! 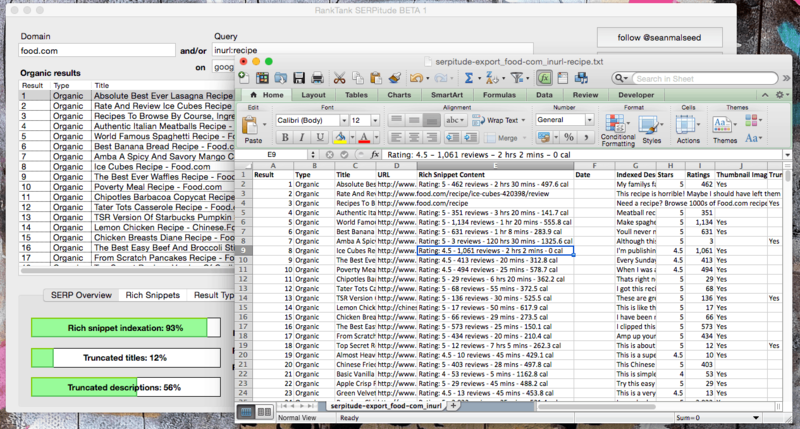 Best of all, you can export all of this data and open it up in your favorite spreadsheet application. NOTE: On the Windows version, the SERPitude Libs folder must remain with the application. Don’t move the app without moving that folder too! 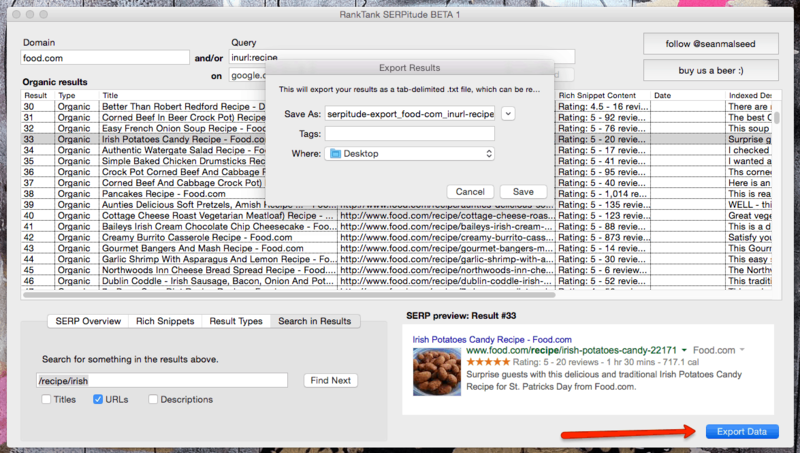 When you first open the app, you’ll see that I’ve set the domain to food.com and the query to inurl:recipe so you can see how it works. 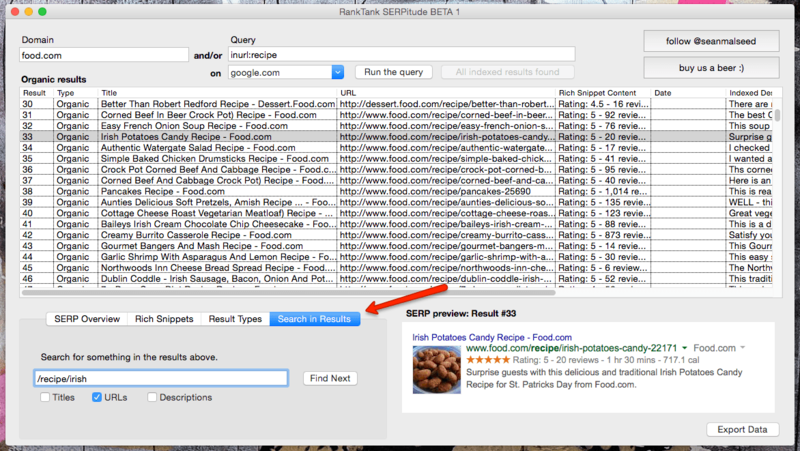 You can now do a lot of cool stuff within the app to analyze the SERP data. For example, you can sort the columns by clicking on the column headers. 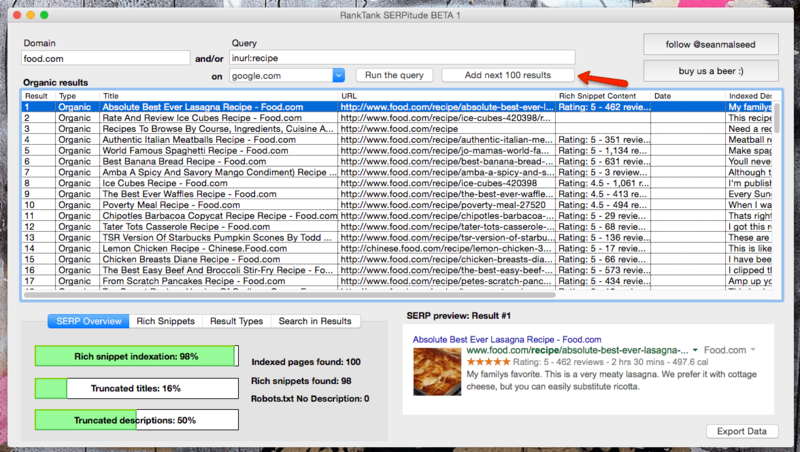 Try clicking on the Rich Snippet Contentto see all of the results with indexed rich snippets! On Windows 10 it isnt working. even with the food.com negative and no results. it ran.. then wont show anything. Using it on Windows 10 and for some reason it is not working for me anymore. No results show. In the SERP Overview tab, it shows negative percentage values. 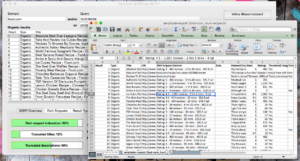 It looks like it wants to show results but I see nothing in the columns. I ran the program as is. Did not move the file anywhere. Does not work on my mac either. Thanks for creating and sharing this! 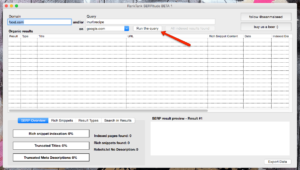 Unfortunately the tool isn’t working on my mac, not even with your example query. Any ideas how to troubleshoot? 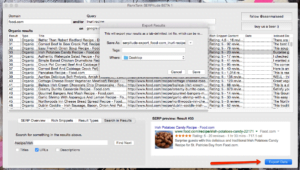 Greetings, I just downloaded the tool for Mac OSX and installed it, but I do not know if it works. I made a few queries, but I did not get results! Hi Silvia, we will look into this. Hey Sean, just tried to download it but the Windows link takes me to a 404. Dropbox says the file isn’t there anymore. Hi Adrien, links have been updated and downloads should work as expected. Does not work for me. Win 8. 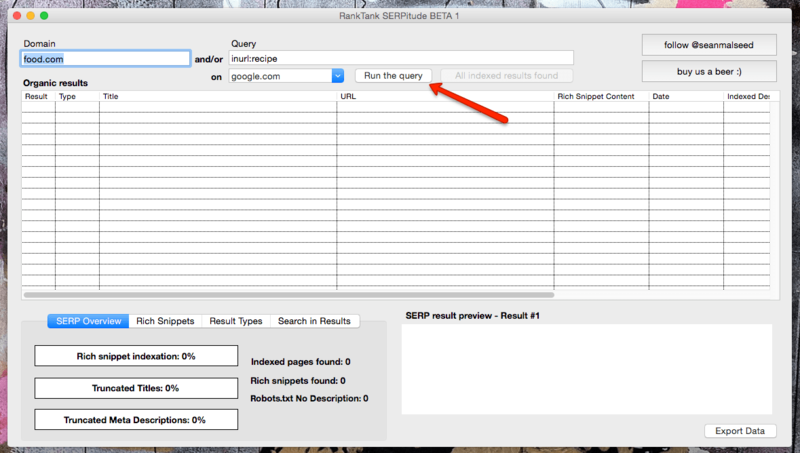 Click run query and nothing happens, for any search engine or setting. Thanks for the resource, it will now to download and run some tests! This is a fantastic tool. I’d expect you’ll be seeing a beer or two come your way. 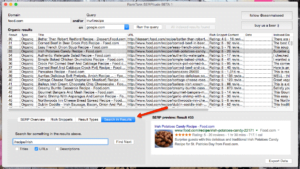 Does anyone know if there is a search parameter I could include to ignore site links? I’m doing some reputation management and would like to filter everything but top level search results. Just checked, and it seems to be working. Can you please explain how do you know exactly what is the page keyword and than look for it’s ranks? Lets take for example you example. What is the keyword you are checking here? You’ve done a pretty nice work, keep it up. 🙂 Looking forward to future releases. seems like a great tool but it doens’t work for me either. Guys, this is absolute boss. Made me realise that I need to switch from “out of 10” to star reviews for culturedvultures.com. Will buy you a beer once I’m not poor. Hi Sean, the windows download link seems to be broken? that’s some cool tool you got there :). I shared it on a famous italian SEO community and we were very happy to beta test it a lot ;). that would be both very cool adds :). Thanks Emanuele! I was watching all of the Italian traffic in GA and wondering where it was coming from 🙂 Those are great ideas! I’m working on #1 now, and I’ll have to see about implementing #2 because it’s great. Very cool Sean, lookin forward about the changes :)! I will be reviewing this tool very soon on the new version of my blog, so expect another bit of italian traffic 🙂 , maybe buy a panino with a beer! PS: i forgot to add another hint: the ability to utilize a proxy or some other way to trigger non localized searches! 1) To confirm, the SERP preview is coming live from Google, and is not something you’re reconstructing? 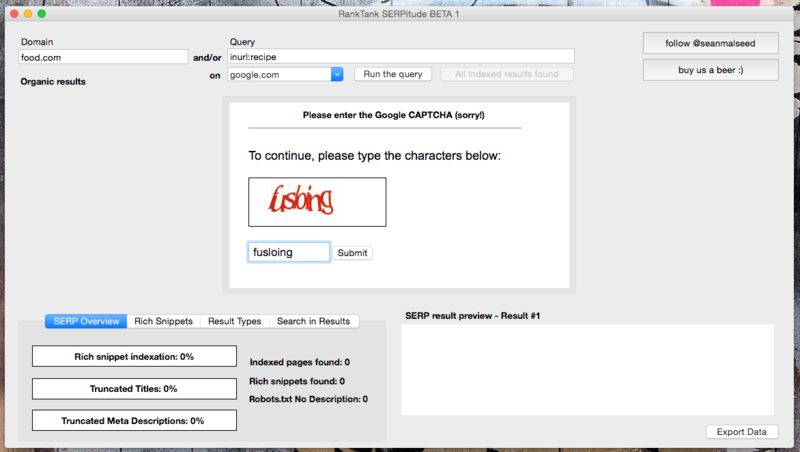 2) When a user runs a query, does Google see it as coming from their IP address? 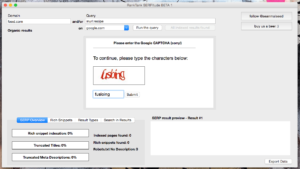 I see you have the CAPTCHA check, but are there any safeguards in place in case Google decides to block your IP for running these mass searches? Thanks Kyle! Happy to answer your questions. 1) Yep, the SERP preview is coming live from Google. 2) The searches do come from your IP, but it’s highly unlikely you’ll get blocked. I’m using an embedded WebKit web browser to get the search results, so to Google it’s the same as if you were running that search through Chrome or Safari. It’s also only one request to Google per 100 results.